Visions of the “good life” are conspicuously absent in contemporary culture. This has sent people searching for a sense of spirituality within themselves, in their communities and traditions, and in the transcendent that lies beyond space and time. Contemporary education has abandoned a connection with spirituality and has failed as a consequence to cultivate goodness in people. Yet there is a deep connection between ethics, spirituality, and education. For spiritual visions respond to our quest for a moral life, and the first task of education is to initiate people into communities that celebrate such as life. The book is divided into three main sections: (1) calls for spirituality and ethics in education, (2) relations between the spiritual and the ethical in education, and (3) spiritual and ethical traditions and practices in education. 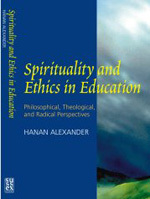 Themes include education for justice, hope, and reconciliation; Jesus as teacher; spirituality and violence; spirituality and citizenship; the spirituality of Arab children in Israel and Palestine; spirituality and children in the Jewish tradition; spirituality and humanistic education; the dangers of spirituality in education; personal and collective spirituality in education; liturgy and literature in spiritual education; and spirituality and peace education. Spirituality and Ethics in Education provides an international, multicultural, interfaith forum concerning the philosophical, theological, and practical foundations of ethics in spiritual education for a rapidly changing world. 5 Learning from Experience: Dewey, Deleuze and "Becoming-Child"